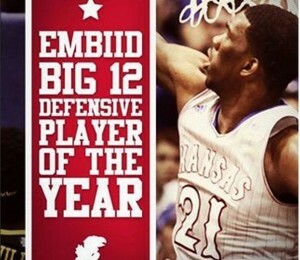 Joel Embiid (2m13) voted best defender in the regular season in the NCAA. The Cameroonian pivot of Kansas Jayhawks was the revelation of American university basketball championship to such a point that he can become the first draft choice at the expense of his teammate Andrew Wiggins. Compared with illustrious names in the NBA (Hakeem Olajuwon and Tim Duncan), Joel Embiid first started with volleyball. The native of Yaoundé (March 16, 1994) begins basketball only in 2011. He got committed to Kansas in November 2012 and makes the law in the racket. During the regular season, the Defensive Player Of The Year, turned in 11.2 points 8.1 rebounds and 2 cons in average. In trouble with his back, Joel Embiid should miss the Big 12. The Jayhawks pivot is expected in the rotation for the Sweet 16.